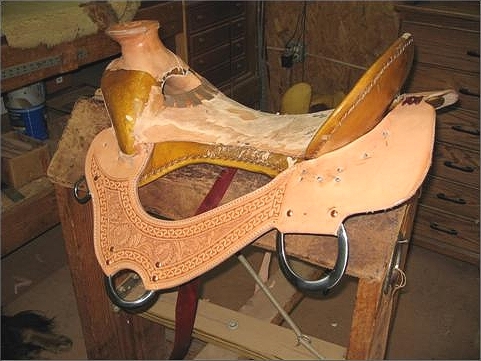 GROUND SEAT/RIGS - Caldwell Saddle Co.
We meticulously hand shapes each groundseat in every saddle we build. 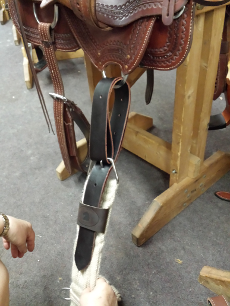 See below for the shape and height you prefer to specify when ordering your saddle. 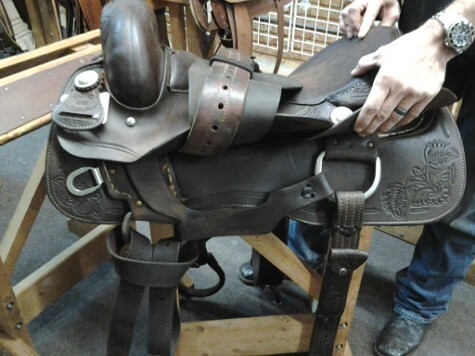 We take pride in Charon's ability to create a balanced, comfortable seat for the rider that is second to none! 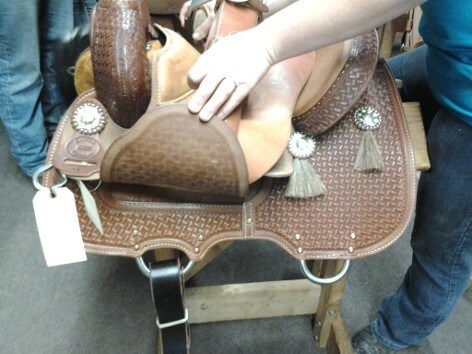 I saw a lady from Iowa almost killed at the NBHA World from an improperly hung lattigo halfbreed. 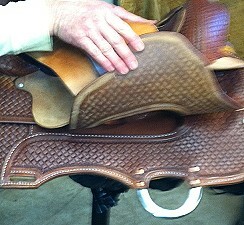 These are softer for the horses' comfort and longer for more adjustment on different sized horses. They are mostly used by trainers saddling lots of different sized animals from 2 - 8 year olds. 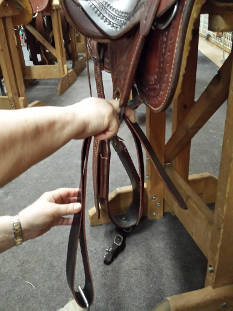 Picture #1 shows a standard doubled & sewn, shorter off-billet which is hung over the saddle's front rigging on the off side; then both ends are passed through and buckled into the girth. Picture #2 shows finished hanging lattigo halfbreed. The following pictures show how to do this. NEVER cut these halfbreeds shorter and use as off-billets. 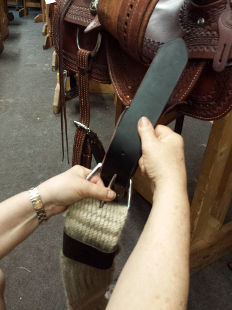 Single ply around saddle riggings and girth buckles can break 1st time they are used. 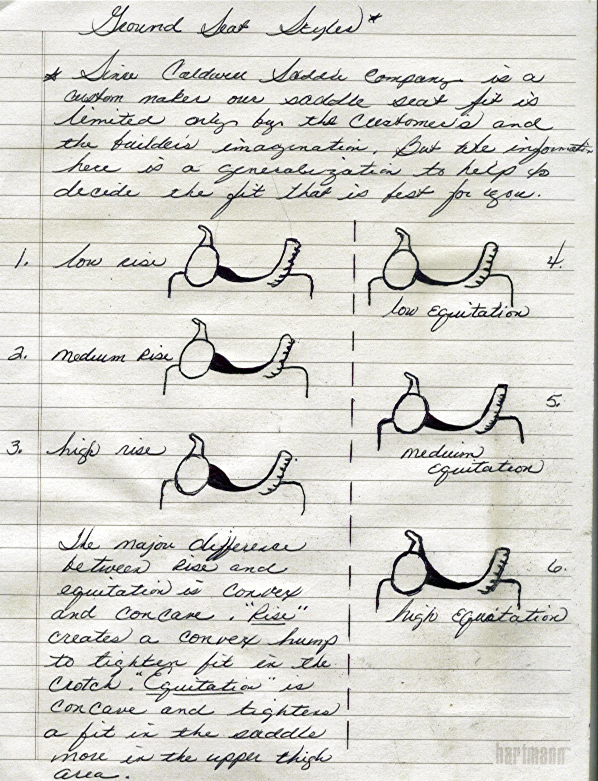 Saftey comes from having double layers at riggings and triple layered at the girth. 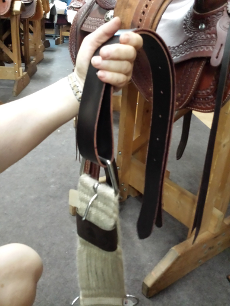 Always tuck ends into girth loop or pockets that are found on quality girths. 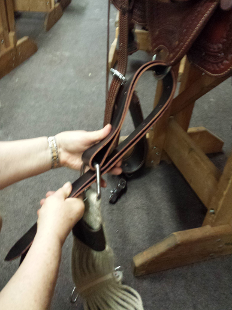 NEVER use girths with chrome or nickle plated buckles because rust will unknowingly eat thru your girth. 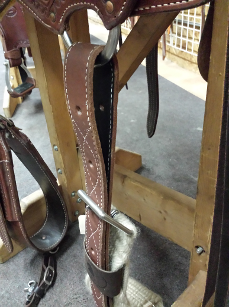 Squared off buckles will not wear out your ties & off-billets the horseshoe curved styles.